Thanks for your interest. Each e-floss is unique, and handmade by me. Use as described or explore your imagination! 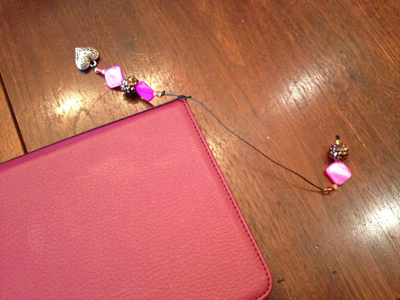 Slip the floss into your e-reader cover with the beads hanging on the outside. The end with the majority of the beads belongs at the top of the cover; it is also possible to determine the upper end because the beads are stationary (knotted). The lower end is adjustable. Make a second knot as close to your first knot as possible, on top of it if you can. 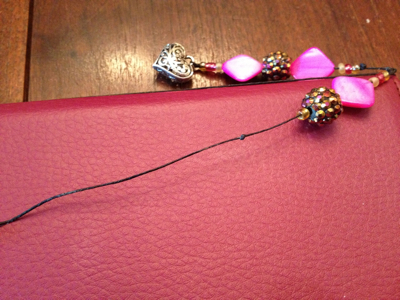 If the floss is too long, it needs to be reknotted at the lower end: Move the beads above the original knot up (so you don’t lose the beads), and tie several knots, one on top of the other, to resecure the lower end, making sure the beads don’t slip through. Trim the adjusted end with scissors. 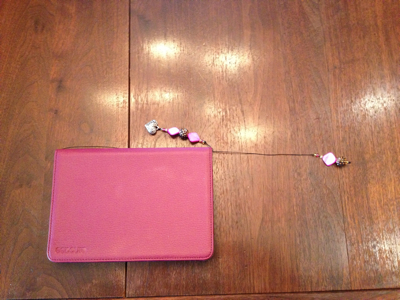 Note: I make sure to keep the floss on the outside of my reader cover so I don’t scratch the glass. If necessary, adjust and trim the lower end of the floss (see Step four of the e-floss instructions) and slide it into your hardcover or paperback book, marking your page.